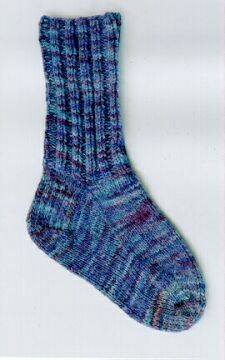 This is a good first sock to knit and will familiarize the knitter with knitting in the round on double pointed needles. It has a ribbed cuff, a sturdy heel and a shaped toe. It comes in two sizes, one that will fit over up to an 11" ankle/heel, and one up to 13". The smaller size calls for 300 yards of sport weight yarn, the larger for 400 yards. The kit has enough yarn for the larger size and comes in a natural gray or hand painted violet-blue. This pattern can be purchased as a download here: buy now.